12/07/2018 02/15/2019 - by Liam Weisman - 2 Comments. Whether you’re a gamer or a casual user, finding a desktop that fits your interest and use is of utmost importance. We take that very seriously here and that’s why we’re always ready to present exclusive deals available in the market, more so online. Today, we review the iBuyPower Slate 9210 Gaming Desktop, a versatile PC with great components and general bang for the buck pricing. Read the whole iBuyPower Slate 9210 Review below. A great blend of components versus great price point makes this desktop a choice worth looking at. The Design and aesthetics of the iBuyPowerSlate 9210 gaming desktop is beautiful and sleek. From first glance, it’s clear that the chassis remains unchanged from other previous iterations we’ve seen. The latest on this list is the iBuyPower Slate 9200 Gaming Desktop which we recently reviewed and one that shares the most with our current unit. Admittedly, nothing much changed for our unit as build quality remains remarkable. There are no noticeable defects, flex or unintended gaps in the frame. The right side panel is still glass panel to allow for a great viewing experience of the interior. To access the innards, you don’t need a screwdriver as there are thumbscrews that safely release the glass off the chassis. Generally, the design is error proof with little to no mistakes…superficial defects if any. Design and execution aside, the iBuyPower Slate 9210 Slate measures 25x 12.5 x 21.38 inches (weighs 30 lbs), similar to the iBuyPower Slate 9200 Desktop. In comparison to other desktops, it wins the heavyweight belt challenge against Dell XPS 8930 Tower Desktop (22lbs) but is less heavy than the Lenovo IdeaCentre Y700-34ISH (33 lbs). Even so, considering this is a desktop and won’t be constantly be moved around, the weight shouldn’t be a problem. That is not unless you’re one who needs a rig to carry around for LAN parties. Other connectivity options include 802.11AC (quote Wi-Fi speed) These speeds are more than adequate for everyday tasks like surfing the internet and gaming online. Nothing beats a well-crafted machine with the right components. The iBuyPower Slate 9210 fully embodies this spirit as it sports an Intel Core i7-8700K Six-Core Processor with a base clock speed of 3.7 GHz (4.7 GHz Max Turbo). On top of that, there is the future-proof Nvidia GeForce GTX 1070 graphics card, 16 GHz or memory, 1TB hard disk storage, and 240 solid state storage all working on a Z370 motherboard. To start off, the Intel Core i7-8700K processor is a high-end processor, certainly among the best in Intel’s lineup of processors. This Coffee Lake invention is a release from late 2017 (September), potent for its additional cores and capable of executing up to 12 threads. The extra cores bring in improved performance by almost 50% making the i7-8700K processor certainly capable of handling demanding applications, software, and AAA games. Graphics card aside, for me, this Coffee Lake is the sweet spot of the iBuyPower Slate 9210 desktop providing performance on a budget. Owing to the Nvidia GeForce GTX 1070 graphics card, this desktop can handle the graphics-intensive tasks such as video and image editing. But best of all, this behemoth muscles through the latest AAA titles at high settings without stuttering or sacrificing much in the way of heat and noise management. Here’s a good example of how Intel i7-8700K processor works with the Nvidia GTX 1070 GPU in gaming. You get the very best frame rates including 4K gameplay. Update: We know performance is every gamers dream in a PC. And I’m talking about great performance. 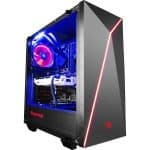 So when iBuyPower recently brought forth their new advanced PC with Nvidia GeForce RTX 2070 graphics card, we thought you should know. The iBuyPower Trace 9220 desktop features this graphics card, impressive up to date processor among a host of other cool features. Check out its full review. Bitcoin miners have almost literally taken over the graphics card market with the rush to assemble the “perfect mining rigs”. In response to this craze, the demand for graphics cards has peaked and prices have gone out of control. If you’ve been procrastinating on building the ideal PC, you might have to keep doing that for a while longer. Or alternatively, decide on a great value prebuilt system (like the CYBERPOWERPC Gamer Xtreme GXIVR8020A5 or the iBuyPower Trace 9220 desktop) because it’s not clear when the prices might go back to normal. But hold that thought, that’s a topic for another day. For crypto-miners, this PC might just be a good start and reasonably valued rig, especially as a prebuilt system. The iBuyPower Slate 9210 gaming desktop ticks all the right boxes for everyday use, for instance, web browsing, multimedia, and photo/video editing. Additionally, gamers looking for a rig capable of 1080p gameplay at reasonable rates won’t be disappointed. The iBuyPower Slate 9210 is a behemoth here with butter smooth gameplay at highest settings. We attribute that to the i7-8700K processor and Nvidia GTX 1070 graphics card. For users with the knowledge of tinkering with components, upgrading to the Nvidia GTX 1070 Ti should actually reveal snappier gameplay on AAA titles. So go ahead and give it a try, I’ll be glad to know what your experience is months from now.